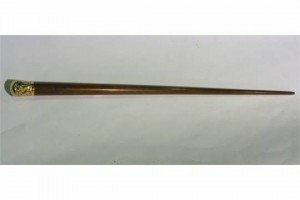 A good quality timber walking cane of form terminating in an applied embossed gold cap with initialled detail to the top. 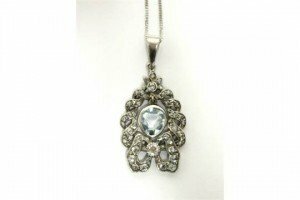 An open-work scroll design pendant set articulated aquamarine within a border of numerous rose diamonds, on 18ct white gold fine-link chain necklace. 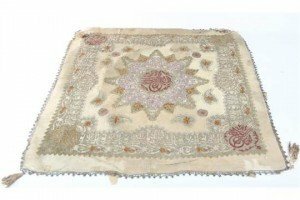 A Middle Eastern silk backed hanging, woven stylised design in silver and gold and other thread work, with tasselled corners. 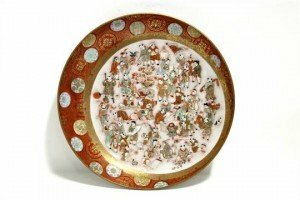 A Japanese Kutani porcelain shallow dish with eccentric centre panel painted with numerous figures of scholars, musicians, acrobats, etc. 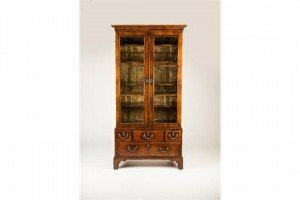 A George II walnut two-door cabinet, the later upper part with four shelves above a period five drawer base on bracket feet. 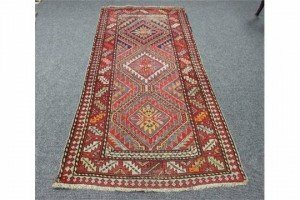 A Kelim style rug, the central triple pole medallion on a geometric ground within a multi-figured border. 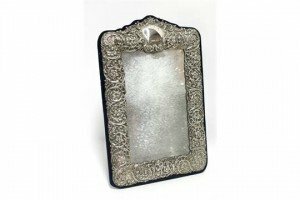 A large pierced & embossed photograph frame decorated with birds, leaf-scrolls & trellis-work, having heart shaped aperture & easel support. 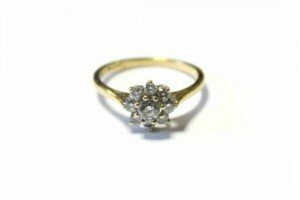 An 18ct gold diamond cluster ring, the centre stone approx. 0.25 carat, within a border of smaller stones. 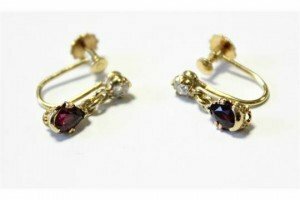 A pair of 18ct gold pendant earrings, each set pear-shaped ruby suspended from a round-cut diamond. 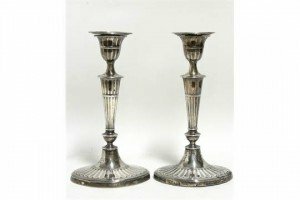 A pair of late Victorian candlesticks with removable drip-pans, oval tapered fluted columns & conforming bases. 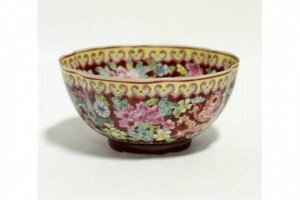 An unusual Chinese eggshell porcelain lobed round bowl of iron-red ground, painted with dragons & flowers in coloured enamels. 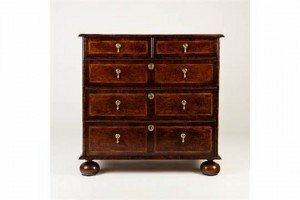 A William and Mary burr yew and walnut chest of two short and three long graduated drawers on bun feet. 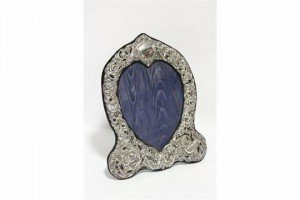 A large rectangular bevelled table mirror with wide embossed frame decorated with flowers & leaf-scrolls. 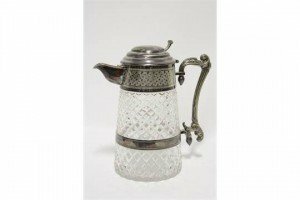 A Victorian cut glass hobnail pattern claret jug of round tapered form, with engraved plated mounts, hinged lid, & handle. 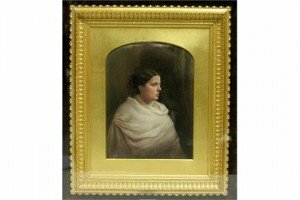 A 19th century continental porcelain plaque, with painted half-length portrait of a lady wearing a white shawl. 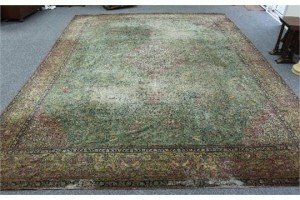 A large Persian rug worked with forest scenes on a green border with central red medallion within a stylised red and yellow ochre border. 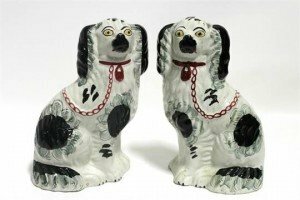 A pair of Victorian Staffordshire pottery flat-back models of seated spaniels with painted black & grey patches, red collars & chains, & yellow eyes. 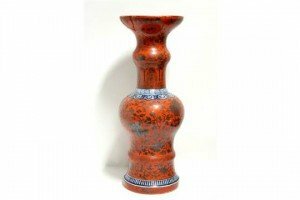 A 19th century Chinese porcelain baluster vase with flared neck-rim, of coral-red ground, with blue & white borders. 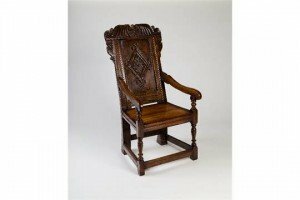 A late 17th Century fruitwood and elm panel back armchair, with scroll and leaf cresting above a lozenge carved panel. 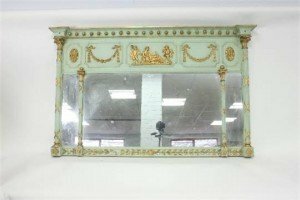 A Regency style parcel gilt three-part overmantel mirror, with ball cornice and classical frieze.